The central government's budget allocation for solar energy for the current financial year is merely 0.45% of the required investment. "We have a target for renewable energy generation of 175 gigawatts by 2022. We have got off to a good start with nearly 12 GW likely to be installed by 2016, more than three times the current capacity,” Prime Minister Narendra Modi said during the inauguration of India's pavilion at the ongoing Paris climate change conference. Of the target capacity, 100 GW would be from solar power, 60 GW from wind, 10 GW from biomass and 5 GW from small hydro power, according to the Union ministry of new and renewable energy. “In order to achieve the proposed capacity of 100 GW target by 2022, the overall investment required would be around Rs 6 lakh crore ($89.88 billion) at the rate of Rs 6 crore per MW at the present cost,” the country's power minister Piyush Goyal said in his reply to a question in the Rajya Sabha with regard to the solar energy target. The central government’s budget allocated for solar energy the financial year 2015-16 is Rs 2,708 crore (0.45% of the required investment), according to the minister’s own statement in the same reply. 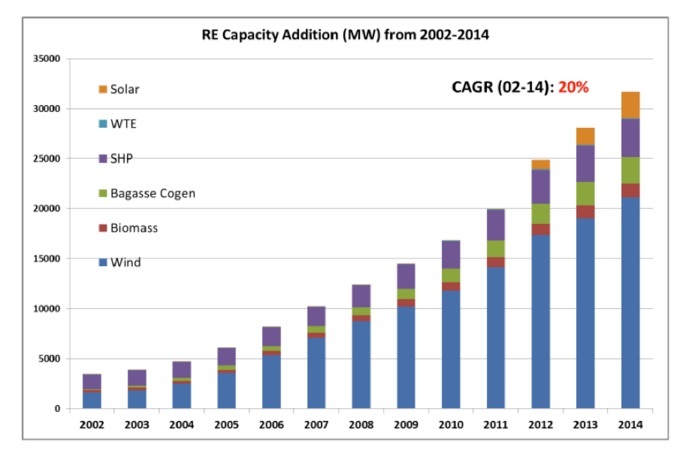 Capacity addition of renewable energy between 2002 and 2014 has been at a compound annual growth rate – the average year-on-year growth rate – of about 20%. India’s installed capacity of renewable energy is likely to reach 147 GW by 2020, according to a report by the International Energy Agency. It would need Rs 8.01 lakh crore ($120 billion) in capital investment and Rs 2.67 lakh crore ($40 billion) in equity to achieve the ambitious target, according to information released by the ministry of new and renewable energy. The Rs 10.68 lakh crore ($160 billion) needed over the next seven years (until 2022) – at an average of Rs 1.53 lakh crore ($23 billion) a year– to meet the stated goal is equivalent to over four times the country’s annual defence spending, and over ten times the country’s annual spending on health and education. Green energy commitments for 2.66 lakh MW (266 GW) were received during the RE-Invest conference held in February this year. As many as 27 banks have submitted their commitments for financing 72 GW renewable energy projects. Earlier this year, the US had committed to support India’s efforts in the renewable energy sector with a $4 billion (Rs 26,702 crore) deal. India has signed a Memorandum of Understanding with Germany “to expand bilateral development cooperation in the field of solar energy by increasing use of solar energy in India through technical as well as financial cooperation”. As a part of this MoU, Germany “would provide concessional loans in the range of one billion euro (over Rs 7,200 crore) over the next five years”. It has to be noted that the government’s investments may not necessarily be capital in nature but could be in the form of subsidies and tax-free bonds. For instance, of the 100 GW target in solar power capacity, 40 GW would be from rooftop solar panels – an endeavour which the government has been supporting through the subsidy route. This article was originally published on Factchecker.in.